Founded in 1865, Loyola High School is the oldest continuously run educational institute in Southern California. Their student body is made up over 1,200+ diverse young men from over 200 zip codes in the Greater Los Angeles area, with 100% of graduates going on to college or university. With an engaged student body and active alumni association, the philosophy of "Cubs for Life" is embodied by students, parents, teachers, and the surrounding community. Loyola High School has a strong history of athletic success, including national championships in both football and volleyball. Winning at least one California Interscholastic Federation (CIF) title for the last ten years running, Loyola also set the California state record in 2002-2003 for the number section championships (5) won in a single year; a record they still hold and matched in 2015-2016. Loyola High School partnered with REPu in 2018 to provide their school and community with the most comprehensive athletics information in one easy-to-use digital platform. "We have partnered with REPu because parents and community demand the most cutting edge app and website to be able to promote Loyola High School and to promote our athletes," describes Chris O’Donnell, Loyola Athletic Director. "Anything you want to know about Loyola athletics, you’re going to be able to get it on this app." 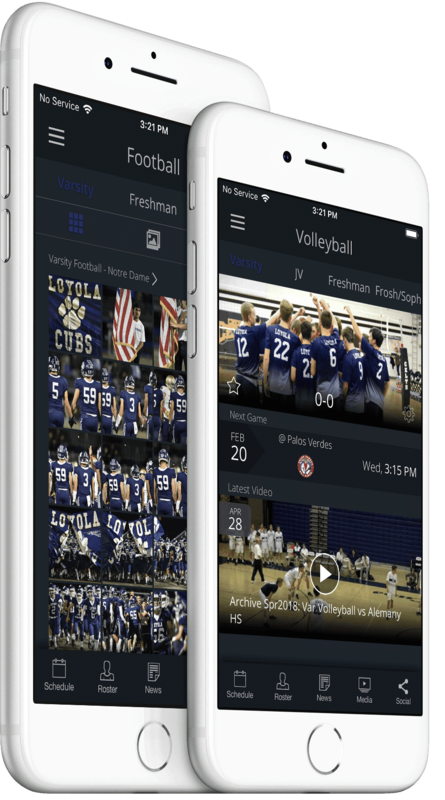 The REPu platform allows for fan engagement in a new and unique way for Loyola High School. Stay up to date with athletics by downloading the Loyola Cubs app from the App Store and on Google Play.